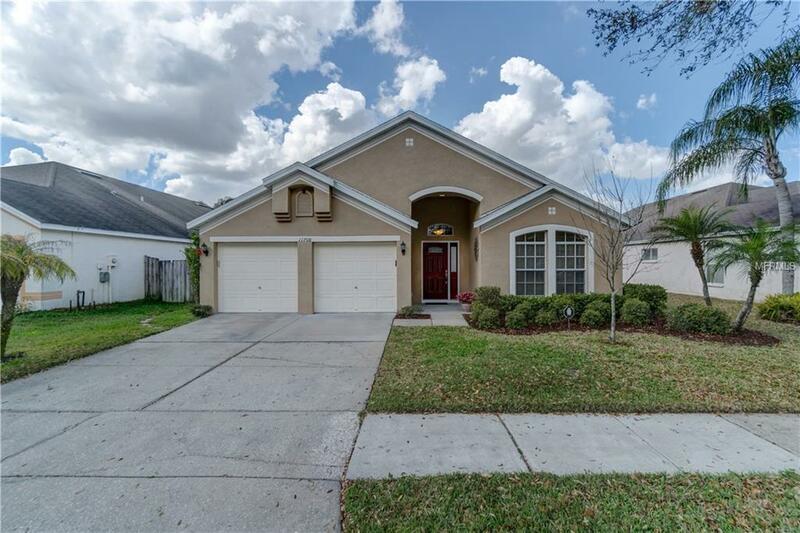 Beautifully updated and decorated- this lovely 4bedroom/2bath Screened pool home is conveniently located in the Carrollwood Village area but tucked away in quiet private neighborhood. You will want to see this meticulously maintained home featuring Split bedroom plan, high spacious ceilings, decorator colors & design, high end Wood laminate flooring, 6 " base board moldings, brick paved pool decking, upscale cabinets with granite counter tops, sky light in master bath offering abundance of natural light, New roof & much more. Floor plan is very open and offers Flexible space meeting any lifestyle needs. Large living room with vaulted ceilings, large open kitchen to family room/dining space. Kitchen features stainless steel appliances, closet pantry and breakfast bar. Master suite with bay window, large walk-in closet and master bath with dual sinks, granite counter tops, garden tub and separate tiled shower. Plus double doors from master lead to one of the bedrooms. Perfect for office/nursery. 3 additional large bedrooms with plenty of closet space is a plus. Guest bath also features granite counter tops and high- end cabinetry. Don't miss the indoor laundry room with additional cabinetry. Enjoy the serene atmosphere on the screened pool deck with brick pavers and spill over waterfall. This lovely move in ready home is conveniently located and close to shopping and major highways.